On July 16, 1943 David was born to parents, Donald and Vida Dowden. He was the oldest of four siblings born at Potter’s Maternity Home in Susanville, California. On July 8, 2018 David passed away and went on to be with his beloved wife, Karen Dowden, who passed on June 1, 2013. David lived a very full life. He was awarded the Purple Heart while on his third tour in Vietnam as a door gunner. He met his wife during his third tour in Vietnam and married shortly after his tour ended, when he was honorably discharged for being wounded in combat. When he returned home, he took pleasure in many outdoor activities, such as fishing, camping and hunting. As time went on, David and Karen settled down and had two children; son, David Kenneth Dowden, on Feb. 17, 1971 and daughter, Martha Jean Allison, on May 28, 1974. David is survived by his two brothers, Chester and Darrell Dowden; one sister, Martha Ausmus; two children; five grandchildren; 10 great-grandchildren; and numerous nieces and nephews. Services were held at 10 a.m. on Aug. 11, 2018 at Diamond Crest Cemetery. 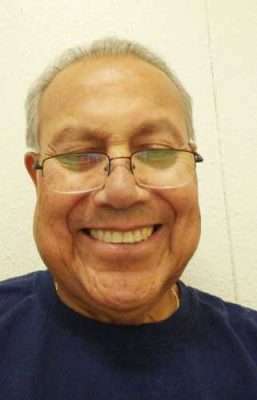 Potluck to follow at Lassen Senior Center, 1700 Sunkist Avenue at 1 p.m.
Mike Martinez, born October 26, 1951 in Loma Linda, California, returned in joy to his Father in Heaven on Saturday, Aug. 4, 2018, at the age of 67. In Susanville, Mike found a fully realized life of home, friends, work and hobbies. He was devoted to his wife Patricia, of 34 years, and to all those around him. Mike was as eager to learn alongside the novices in his field, as he was to teach the most skilled experts in his work as a safety officer for the National Forest Service and various military installations from Camp Pendleton, in San Diego, to Guantanamo Bay Naval Base, in Cuba. His generosity and admiration of service defined him. He was known for his dry humor, his love for the craft and consumption of good food and his enthusiasm to host or attend a good garage sale. With Pat, he exercised his passion to rescue and care for animals in need. Mike has been greeted in Heaven by his two newborn sons, who preceded him in death; as well as by his brother, Donald; his sister, Sandra; his parents, Mike and Mary; and his beloved grandparents, Antonio and Lucinda. He is survived by his wife, Patricia; his daughter, Deborah and son-in-law, Gabriel; his son, Tim and daughter-in-law, Erica; his grandchildren Anthony, Alyssa and Adam; his sister, Dolores; his nieces, Virginia and MaryJane; his nephew, Valentine; and by a steadfast family of friends who will all miss him dearly. Mike will be cremated and his ashes will be spread over Monterey Bay in California. The family will determine a future time and location to hold a gathering in honor of his memory. We are so sorry to hear of Mike’s passing. He was a good guy!